Is there a room in your home that you like but maybe you would love it if had a little decor help? I felt that way about one of my guest rooms. It had nice furniture and great bones, but it had become just a tad tired around the edges. Rooms like these are perfect for freshening up. These rooms don’t need an entire makeover…we don’t have to throw the baby out with the bathwater. What we need are a few tips to get us rolling in the right direction and a plan to spruce things up a bit! 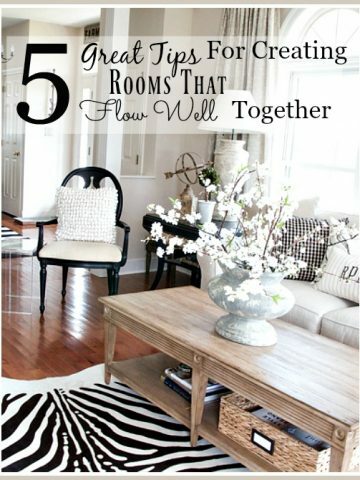 Here are 5 tips to refresh a room! 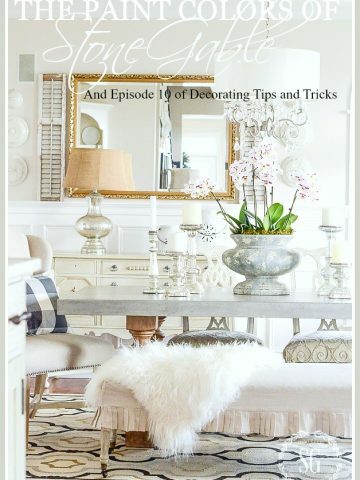 Today on Decorating Tips and Tricks we are sharing secrets for cleaning! Better cleaning, easier cleaning, quicker cleaning! Lots and lots of cleaning tips and hacks! Now let’s refresh a room! The front guest room at StoneGable was in need of a few changes. 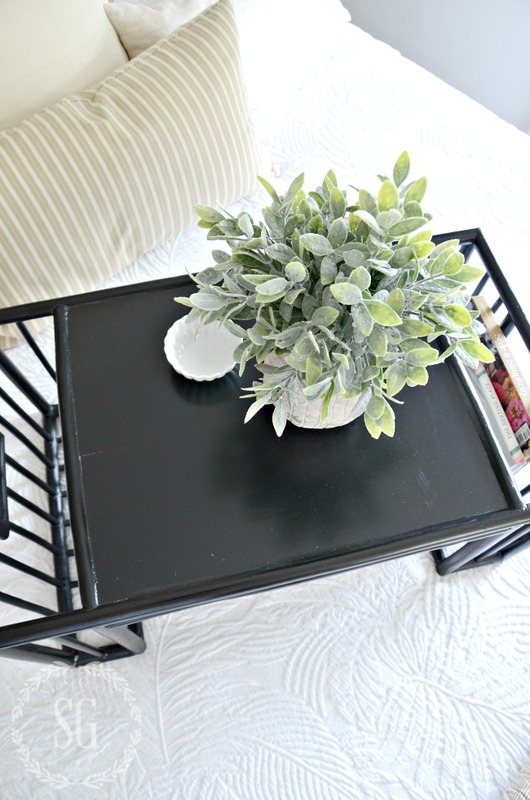 I used these 5 easy to do tips to give it a fresh updated look! I’m amazed how easy it is for the rooms in my house to collect things. Things that don’t belong in that room! As hard as I try it’s just the natural way of things around here. The first thing I do when I’m going to do any kind of makeover, big or small, is to purge and edit… and purge and edit… and purge an edit. My mantra is BE RUTHLESS! I like to keep our guest rooms uncluttered so our guests have space to move around. 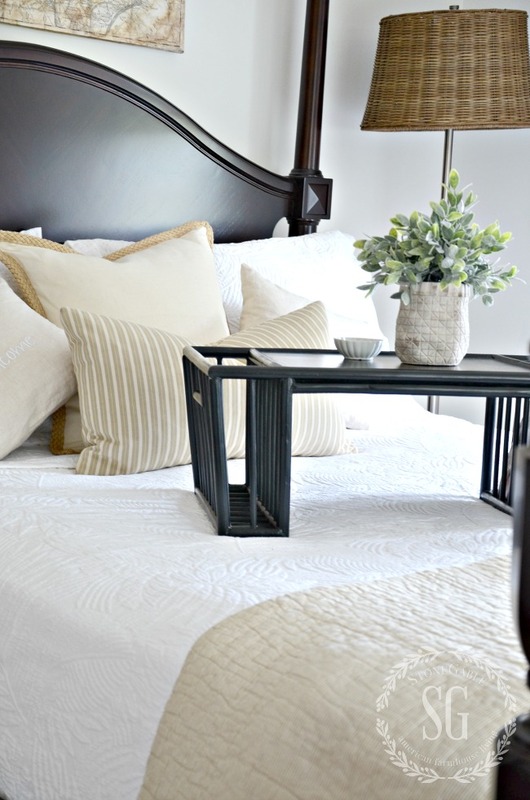 Less is best when it comes to a guest bedroom. So purging is a must!!!!! When it’s time for you to change things up a little, you should think about doing this first. It will make you feel amazing!!!!!! I think one big question to ask yourself when freshening up a room is DO I NEED TO PAINT ANYTHING? Ceiling, walls, doors, molding, closets? Now is the time to get out the paintbrush! A fresh coat of paint makes a huge difference any a room! I’m always so surprised how bright and clean my rooms looks with a fresh coat of paint… even the same paint. Our painted surfaces get dirty, dusty, grimy and scuffed! So get out those paintbrushes and rollers and let them work their magic on a room! Knowing what is and isn’t working in a room takes thought and a critical eye. I try not to let sentiment get in the way of making a change. And for me, that’s hard! But I have to steel myself against keeping things that no longer work in a room! Yes, that might be my great grandmother’s sewing machine but would it look better somewhere else. And yes, my Aunt Suzy did give me her perfume bottle collection, but maybe keeping just one bottle would be fine to remind me of her. And wouldn’t some of my other female relatives like one too? The more sentimental an item is the harder it is to make the decision to keep it or to do something else with it. Make a list of what isn’t working in the room and get working on changing one at a time! One thing that really was not working in this guest bedroom was the quilt. All my beds here at StoneGable are covered with white quilts. But the one in this guest room had really seen better days. So, I got this stunning stitched Mustique Matelasse Coverlet and matching Mustique Matelasse Pillow Shams. They are soft and oh, so pretty! Everything has a lifecycle. For me, it’s easier to replace or upcycle one thing than it is to wait until everything in a room gets worn out and then try to replace it all. Or worse, to becomes so overwhelmed that I don’t do anything! When it’s time for a little refresh make one great investment! You will be so thankful you did! For the guest room, I replaced a chair with dated fabric on it (it’s being slipcovered and is moving to another room) with the gorgeous Fioravanti Upholstered Settee in “Mineral”! Oh, I love this little sofa. The fabric is just gorgeous!!!!! Sumptuous is the best word to describe it! 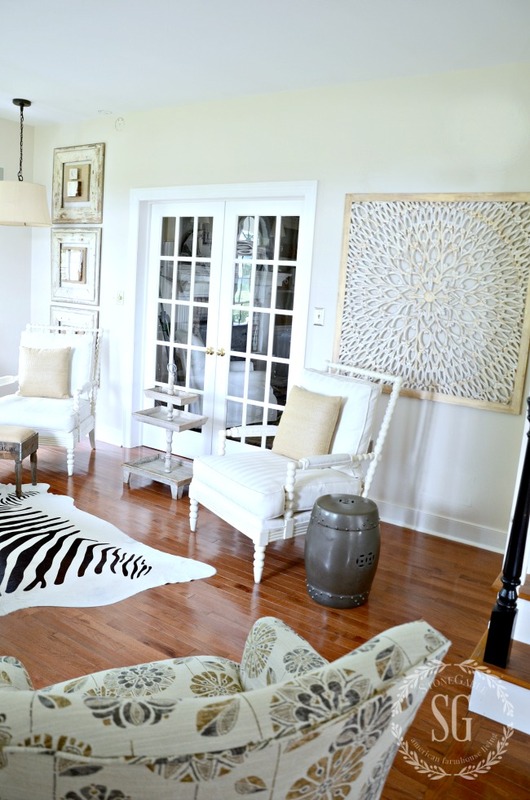 My favorite way to add new accents to a room is to shop my house and change things up a bit! Things are always finding a new home at StoneGable! The little plant came from another guest room as did the pillows and the quilt/throw at the end of the bed. I did add a pretty dust ruffle to the bed. I felt it looked a little bare without one! And I’d been sighing over the Raw Silk Woven Bedskirt for quite awhile!!!! Isn’t it a beauty? 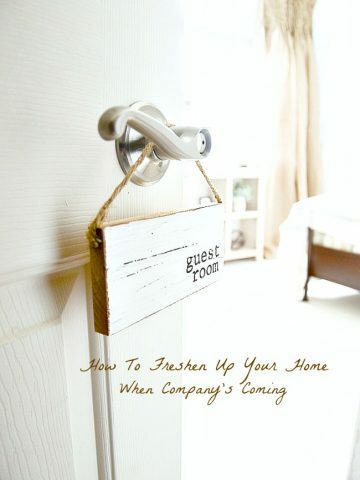 The next time your room could use a little freshening up remember these 5 easy tips!!!! I could never find the perfect piece of art for one wall in my living room until I saw the Anguilla Grille Wall Plaque! This is the most exquisite piece and I am thrilled to have it in my living room! 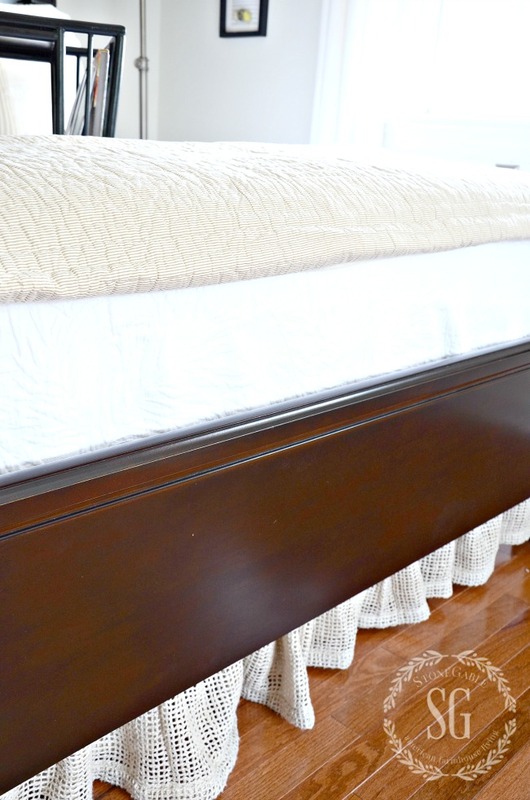 Thank you Soft Surroundings for helping me refresh my guest bedroom! 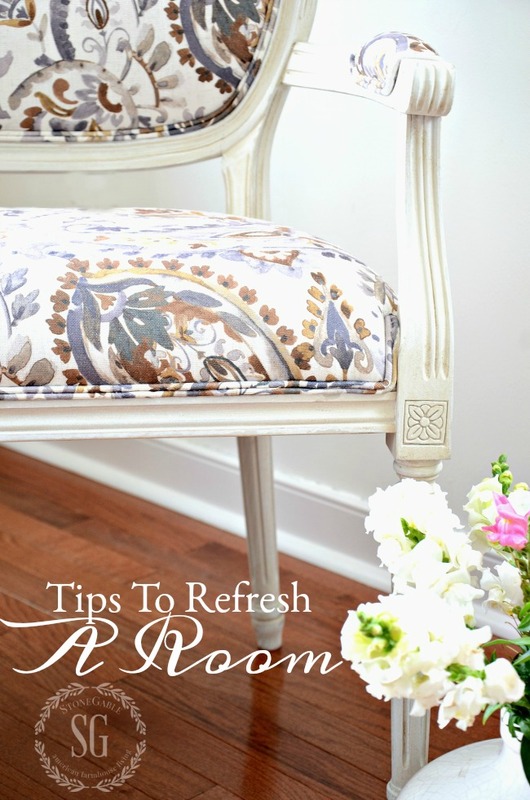 Be sure to check other blogs on the room refresh tour sponsored by Soft Surroundings. Fabulous, gorgeous, outstanding out of this world amazing job. I adore what you’ve done to refresh your guest bedroom. I would like to add a bed skirt to my guestroom bed; but I’d like to know how you’ve attached it. If I put it over the box springs, it will cover the beautiful wood side rail. Suggestions? Hi Darlene, why don’t you put your bedskirt on your bed and tuck it in behind the rails. I know only the bottom of it will stick out but it will be very pretty. Many people usually have a believe that a home makeover demands huge investment, new furniture and other customizing materials. Really I don’t know why people think like this, but genuinely I don’t think so. I think even small change can bring zing about our living space. It does not matter how big is your budget, if the change is done on a whim without proper planning, then we won’t get the best return from the investment. I personally believe that efficient planning and art of implementation, both play a key room in energizing the room. So, if you want to make your room more engaging then do everything wisely and if possible then take the help of an expert for the same purpose. your home is just amazing…… i think your photography is just so clear….every detail just pops…. do you dust every day?!?!?!!? Love it all! Thank you for the great tips cause I have a hard time in purging! I am working on my guest room right now. It does take some thought especially because it doubles as the grandchildren’s toy room. LOL! I will get it worked out though! Gorgeous!! Love the whole guest room design. I noticed that lovely bed skirt immediately and I’m glad you shared where it came from. Oh, Yvonne, I always let out a big, comfy sigh when I am “in” your home. It is so welcoming and cozy. Thank you for all the inspiration. The room is so fresh, light and so inviting. Your guests may never leave. Gorgeous – love it all! That fabric is stunning!! I really do like the settee. It really sets the new feeling in the bedroom. As usual, you did it again a ‘fresh’ feeling that the door wreath sends to the stairway. Thanks, again, for sharing your home. Thanks for 5 good ways to spruce up a room. I love the settee. The fabric is lovely. Your guests are so lucky to have such an amazing room to stay in! 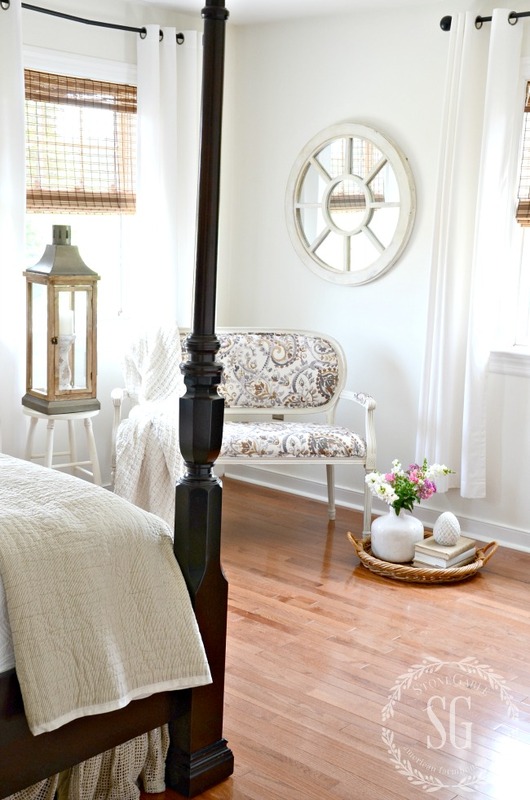 Love the room re-do….it looks so fresh and inviting with an airy look. Very well done! As. Always I loved the changes! But I also appreciate the tips on making over a room. Paint. Don’t skip! I want to paint a room that’s gone way too long. We’ll have someone do it! Then you said clear out and be ruthless. Ruthless. Stick in my head! Your guests will feel extra welcome in this new space I’m sure! This room is beautiful and so warm and inviting. So many good ideas as I look at every detail. Is this room white? What is the color? I love it!! Hi Dale, the room is painted Simply White by Benjamin Moore. I love, love. love the settee and the bed skirt!!! I am going to keep Soft Surroundings in mind for my next home furnishings purchase. What quality items! Thanks so much for the scoop! Inviting and Chic! 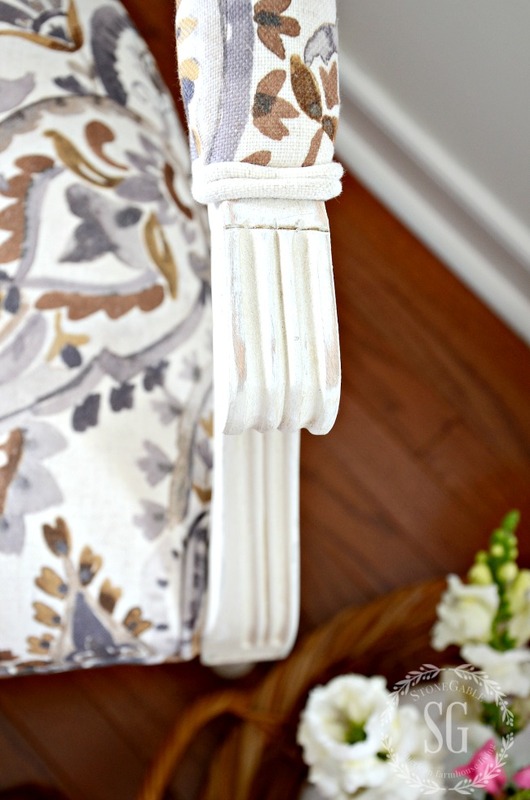 Your settee is the frosting on the cake.. perfect fabric and amazing with the “touch of Africa” table I swoon over! Thanks, Darlene. 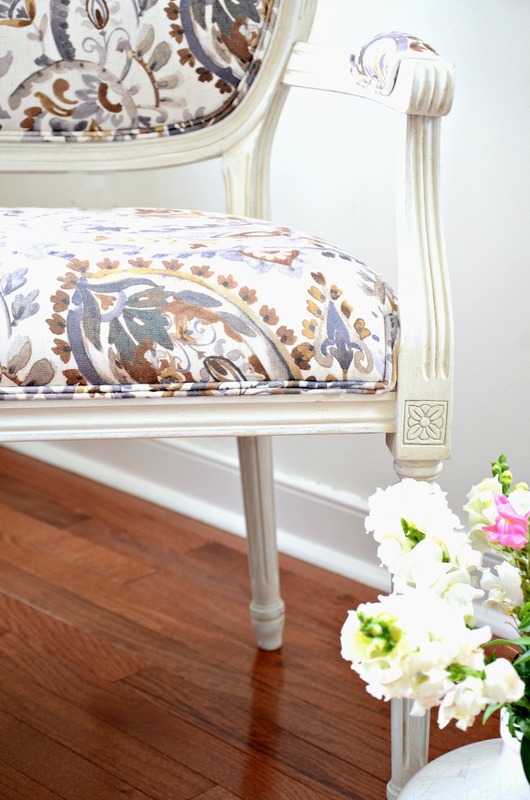 I really am swooning over this settee! It’s something so so special! Of course I Love your guest room! All your decorating is beautiful! I also love the bed skirt. I have a bed frame like that and wondered how you attached your bed skirt? I have an idea what to do, but wondered what your trick is? Keep your wonderful decorating ideas coming. The ruffle of the bed skirt is attached to a sheet of sorts. So the sheet with the ruffle edges is put on in between the box spring and the mattress. So easy! I was going to ask the same question since I have a similar bed frame. The problem is the bed slats won’t allow the bed skirt to hang between the box springs and frame. I’ve been wanting that bed skirt for a long time but the only way I could see it work would be to make alterations and at that price, I didn’t want to risk taking it apart and it not working. I would love to paint my closets doors but it is hard to take them down so that is one that will have to wait on. love the chair and the mirror. I am loving everything about the settee in your guest bedroom. I also like the no fuss bedding. Great job as usual! Yvonne,I love your sette and the fabric choice. Also, the dust ruffle is neat and makes a complete package with the lovely bed cover. Your guest room looks very inviting. Beautiful guest room! Can I come on over and spend the night?Slumber party would be so fun! I am so in love with your style of decorating. I follow you from New Zealand, a small country in the Pacific & last stop before Antarctica. My rooms are quite small, for example the main bedroom is 3500 x 4700 and there is no walk in wardrobe. I have a dressing table and a chest of drawers along with 2 bedside cabinets and a headboard only in dark wood. Like you I have white quilts on the beds in all the rooms. Are there any tips you could help me with please. Thanks so much and keep your fabulous blogs coming. Kiwi Girl! Thanks for visiting me from New Zealand. Visiting your beautiful country is on my bucket list. Your room sounds charming and I would certainly play up its charm and coziness. 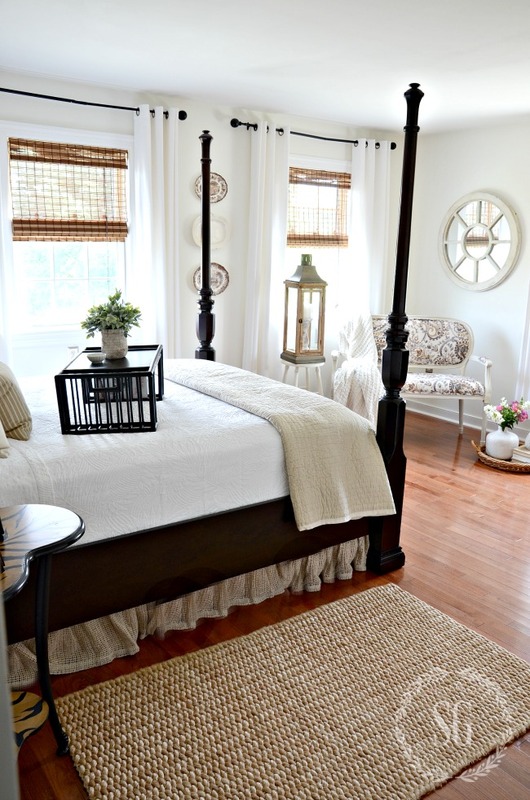 A white coverlet would make your bed and room look larger as would painting your walls white. Do you have any windows? Put white curtains on them too. Keep the chest of drawers and the dressing table and make sure you have a big mirror on the dressing table. Add gorgeous and larger accents on them. 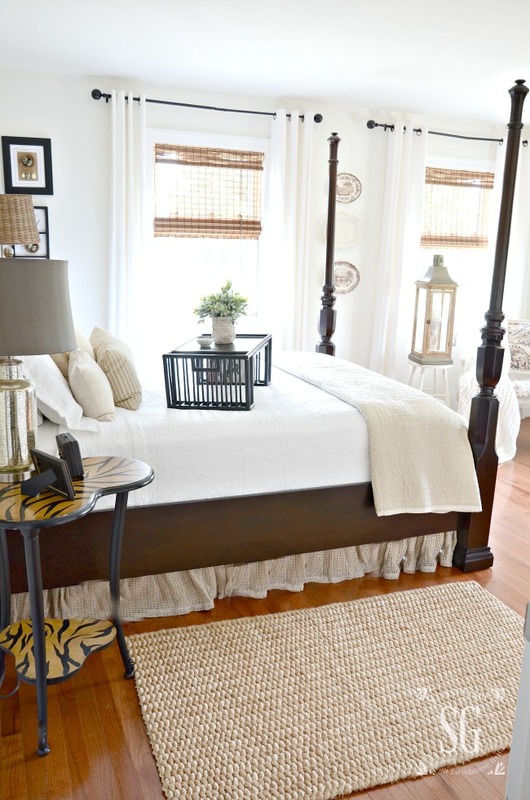 Don’t forget a beautiful, soft to the feet rug under and around your bed in a pretty soft color! Hope this helps. Love the addition of the bed skirt and plaque. Purging and editing are my problems. I know Nell! It’s my problem too! That’s why I say “RUTHLESS”! Absolutely beautiful and inviting, love to change my decor each season, just switching a few thing really helps. I live your suggestions…. was speechless upon seeing the design and colors of fabric. It really is the perfect sample to show the colors that may be used throughout a mostly white or neutral design palette. Yvonne perfect choice. Very nice post. I need to do some purging. I love the settee and the dust ruffle. And the entire room!!! Oh I love the little bench in the guest room. The material is so pretty in the blue and browns. We recently moved from our Philadelphia home of 33 years to new adventures in New Mexico! For the last year in Philly we were in a purge and pack mode. I’d say to my family ‘be ruthless!’ So our mantra became ‘there’s no Ruth here’! It worked. Now we can fill this house! Soooo cute Vee! What ever work, right? Your updates look great!! I love the settee and bedskirt is like oh WOW!! but i really loved the new piece in the living room. SO SO pretty!!! 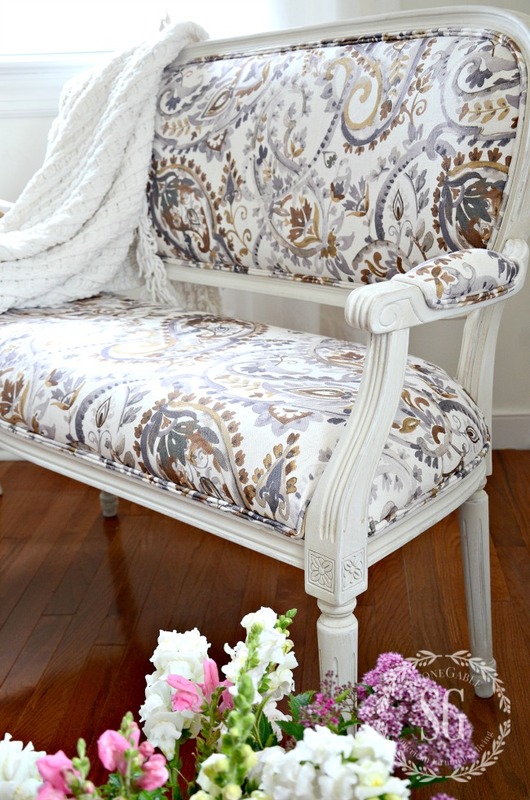 The French settee is a lovely addition to your room. It provides seating in the bedroom that is unique in style. 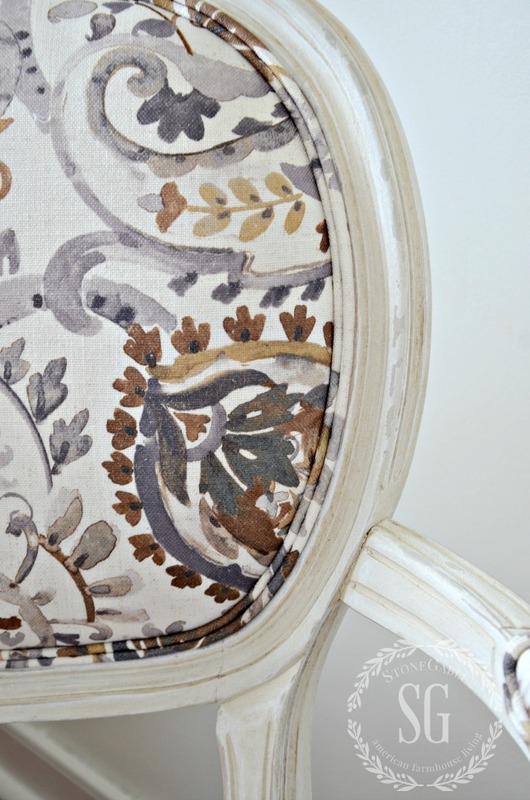 I LOVE French details and accents! 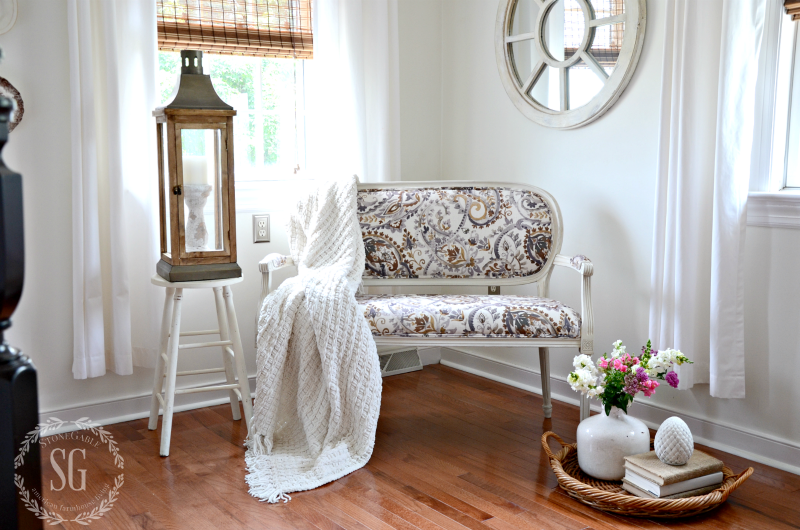 love the guestroom “redo”…the bench is beautiful!!! Just beautiful Yvonne! 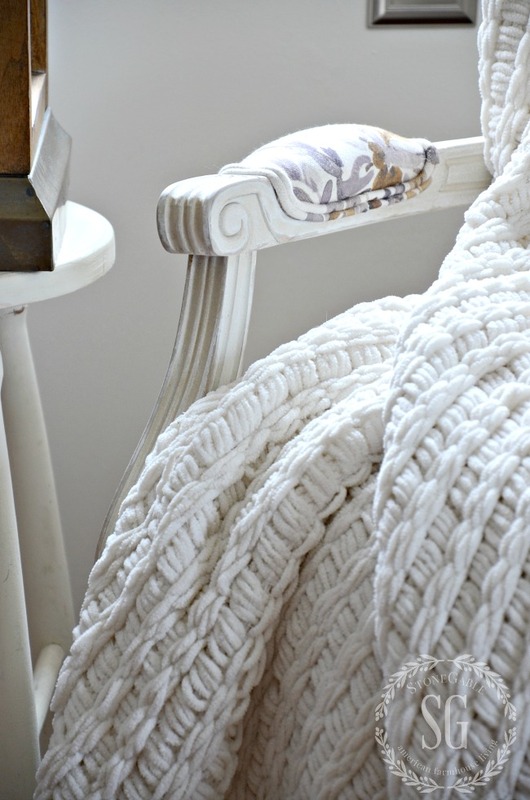 I especially love the coverlet and shams. So beautiful and calm. It would be hard to leave this guest room! Such a lovely, welcoming room. Soft surroundings is my favorite place to shop when looking for something. The room looked great before, but the updates really make it special. Great choices! Love what you did…i am always looking for new ways to refresh, you inspired me!!!! I like the updates and the settee is different and unexpected. I like the bed cover on the bed. It looks so soft and comfortable. I also like the bed skirt and will be checking that out. The room looks inviting. What I love about the bed cover is how soft it is! Love the fresh bright style and the settee! Awesome! While rereading an article in an old issue of Country Living. 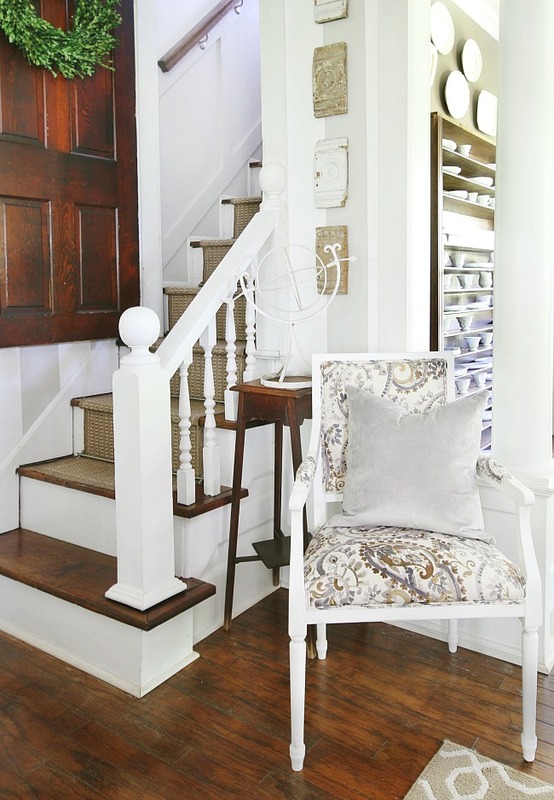 I found these words: “‘polished farmhouse’…ample collections–in a refined and radiant way”. Those words shouted Yvonne’s style for me. Just thought I’d share my thoughts with you today. Your guest room is so warm and welcoming! Love the bedskirt! 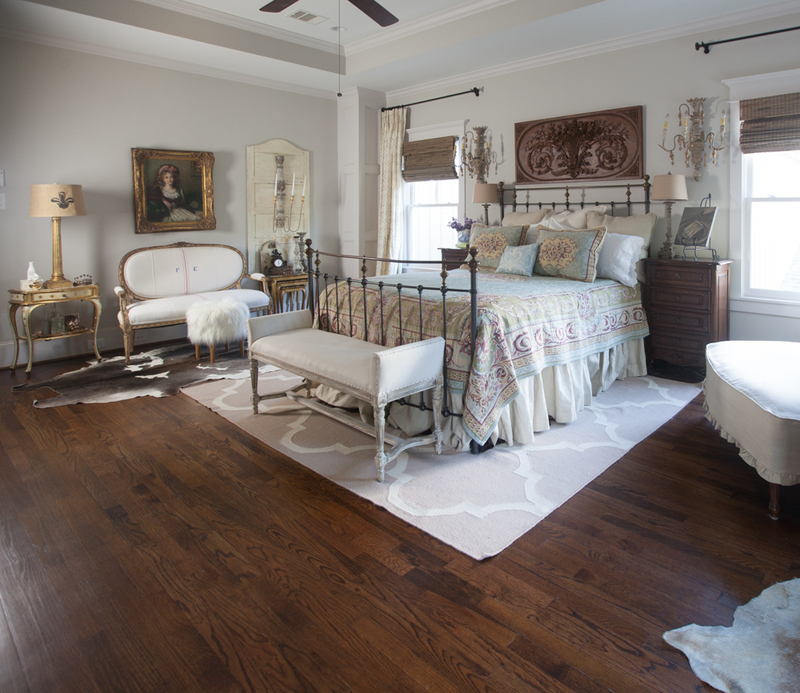 Oh my what a gorgeous room Yvonne! Is this where I’ll be staying when I come? Hurry up! I can’t wait for you to come! I just painted my guest room and it made a huge difference. Since this was a basically new room to decorate for me I was able to start with a fresh pallet. I’m still tweaking it though! As usual, very lovely. I love your tips and you always inspires me. On to my next projects. Thanks, enjoy your day. Love the room…great tips (as always)!! Love the look of the tray on the bed and have one on my guest room bed but always wonder where to put them when using the bed? What do you do with it? That is such a beautiful room and the Settee is GORGEOUS!!! Would you mind letting us know what size this room is so that we can gage the size of the furniture? I always have a problem wanting to put too much in a room. This is a beautifully clean look. 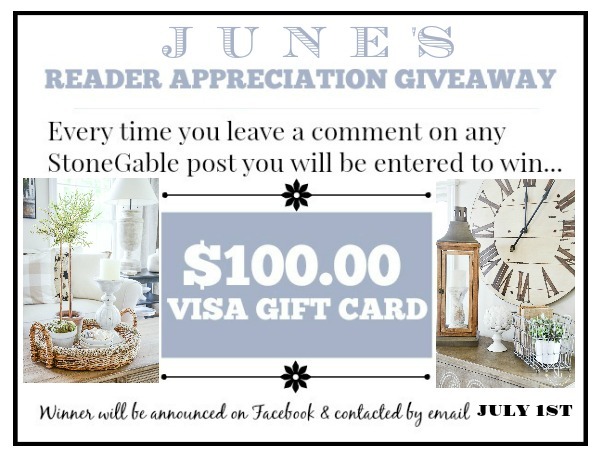 I’d love to be a guest staying in your guest room! So relaxing and pretty. As always, a lovely update. I totally agree that painting something and shopping the house are wonderful ways to freshen a space. Your little settee is truly a work of art. Thanks for sharing. The room looks so peaceful! 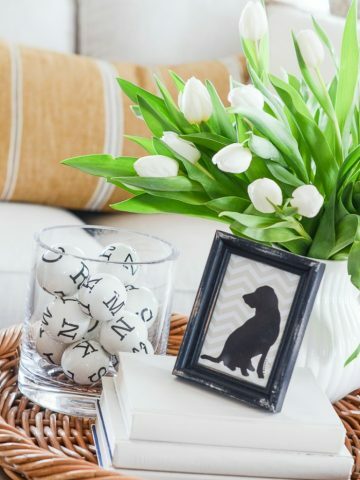 What a lovely way to make your guests feel welcome to your home! 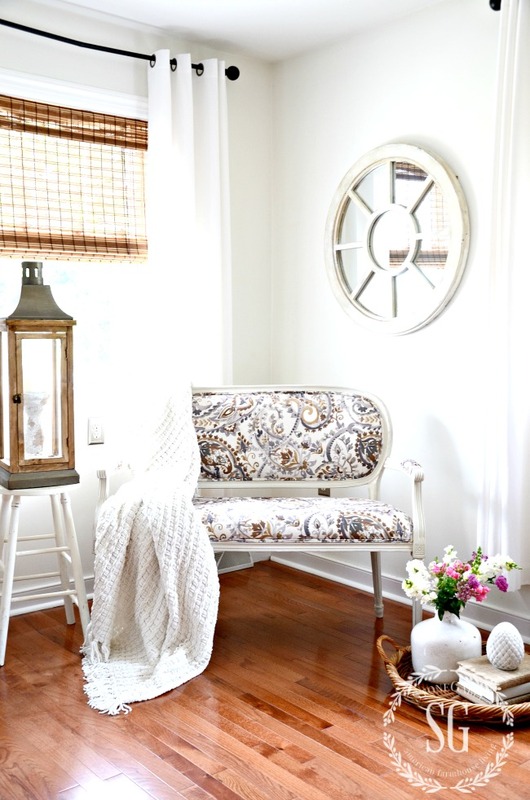 That settee is a beauty and so perfect for the guest room! Oooh, the fabric on the settee and that wall plaque. Just gorgeous. Love the sofa chair! Beautiful guest room!! Such a beautiful room – you amaze me! So pretty. I do love bedskirt. I have just the room for that one. The settee is really pretty. I will have to start looking for one. Yvonne, where did you put your breakfront? I’m missing it! After living with it for a few years, I was never happy with its heavy look. So I gave it away and replaced it with something fresh and beautiful! Beautiful!!! Such lovely fresh and airy looks! !